I’m not new to growing plants from seed but faced with 23 packets of potential from the Alpine Garden Society’s seed exchange I was a little apprehensive, a feeling not unlike a hiker at base camp ready to climb a mountain. 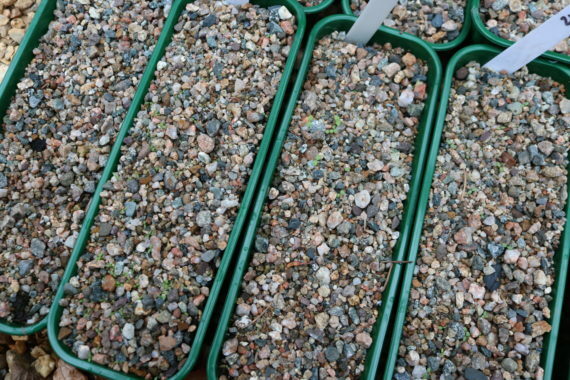 The only alpine seeds I’ve grown before are Aubretia – simple to sow and grow on but, as sometimes happens, I neglected mine in summer when busy with other jobs. 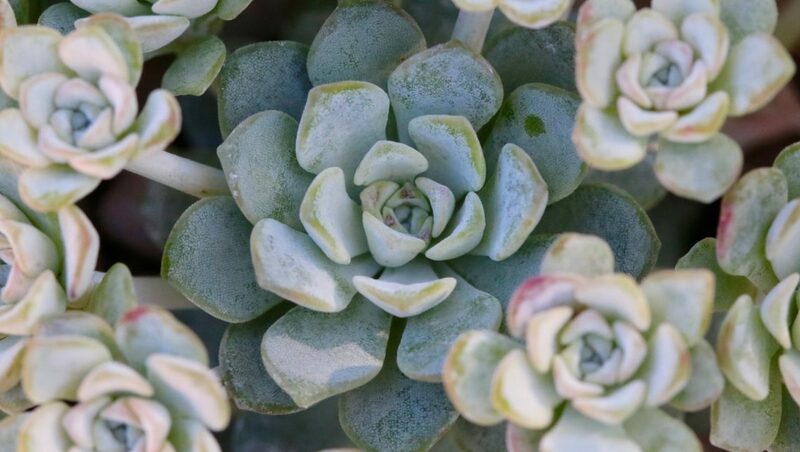 Most met a desiccated end before I had the chance to plant them out in the garden, although one survived and looks stunning in my garden wall. 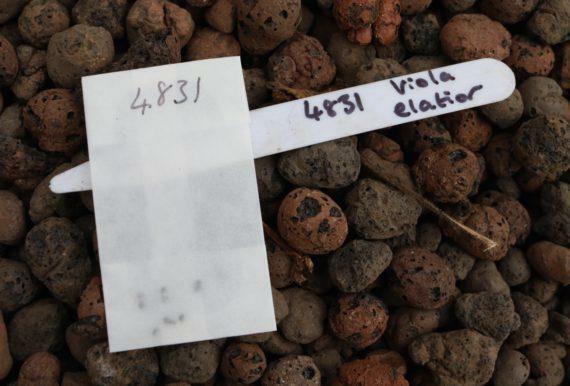 In the tiny waxed envelopes despatched by the AGS voluntary team, I knew I had some similarly stunning plants which will add interest to my garden troughs, pots and beds. Like the prospect of the view from the top of the mountain, the thought of these beauties made me take my first step. 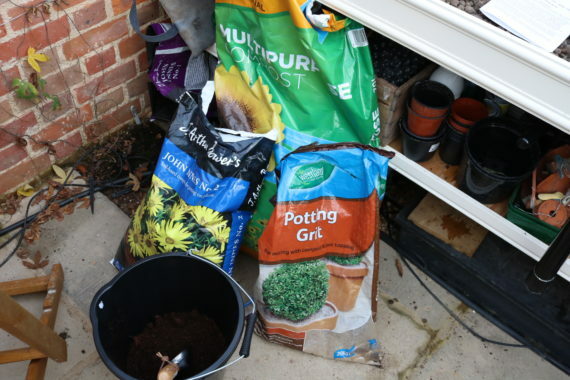 Whilst no fancy kit is strictly needed to start these seeds off, alpines ideally need a free draining seed compost mix. The notes accompanying my seeds suggested a mix of equal parts John Innes No.2 compost, multipurpose compost and potting grit. I’d run out of all three so off I popped to my local garden centre. 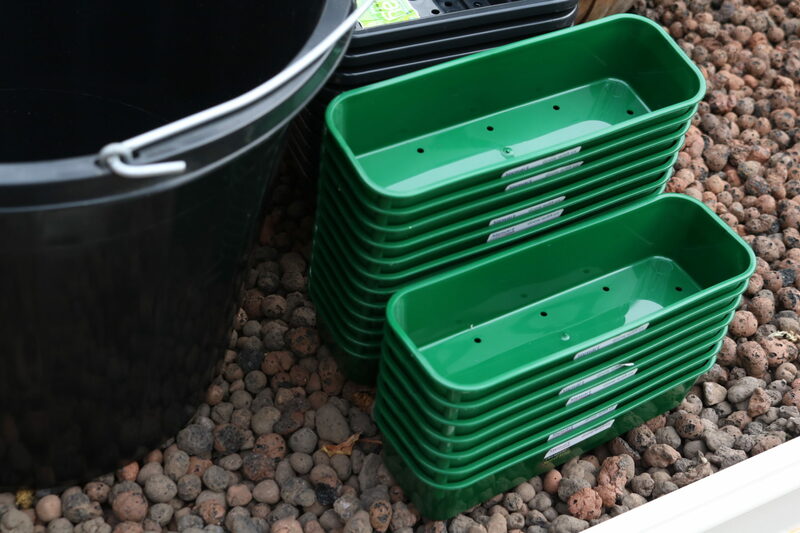 Whilst there some small heavy-duty seed trays caught my eye. I’m trying to reduce how much plastic I use in the garden but these are great quality and will last a lifetime. 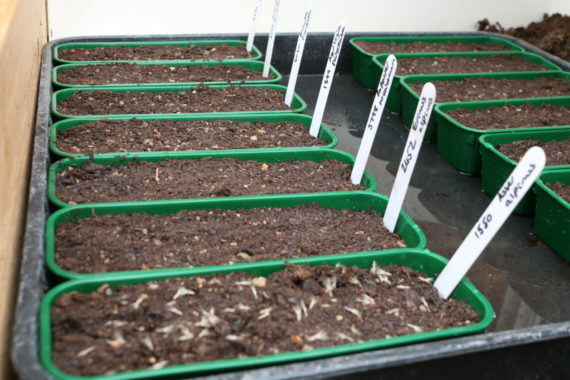 I thought the small size good as quite often I choose not to sow a whole packet of seeds. The AGS seed packets are small and whilst a small round pot would have worked, I chose to use my new seed trays for my precious alpine seeds. 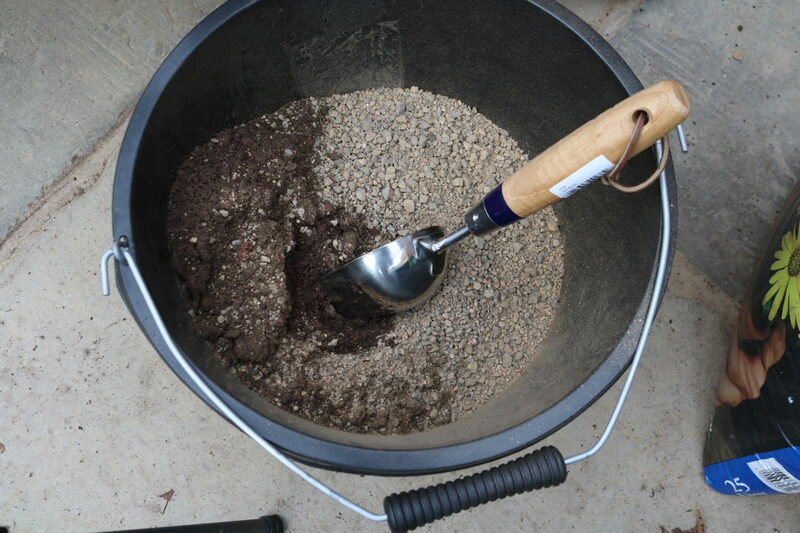 I used a bucket to create a mix of equal parts (one-part each) John Innes No.2 compost, multipurpose compost and potting grit. I then filled my little seed trays, leaving enough space at the top for a covering of grit later. This is a technique suggested by the AGS and which I tend to use for all my seeds. 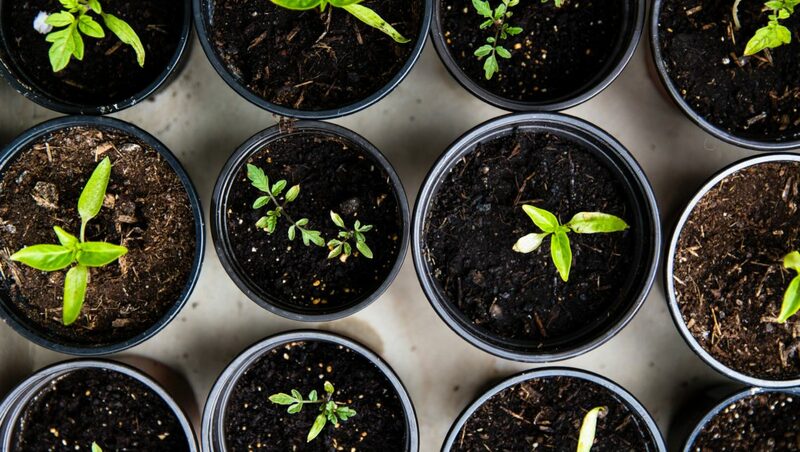 By standing the filled seed trays in a deep dish of water, the compost gradually soaks up sufficient water to aid germination without being waterlogged. 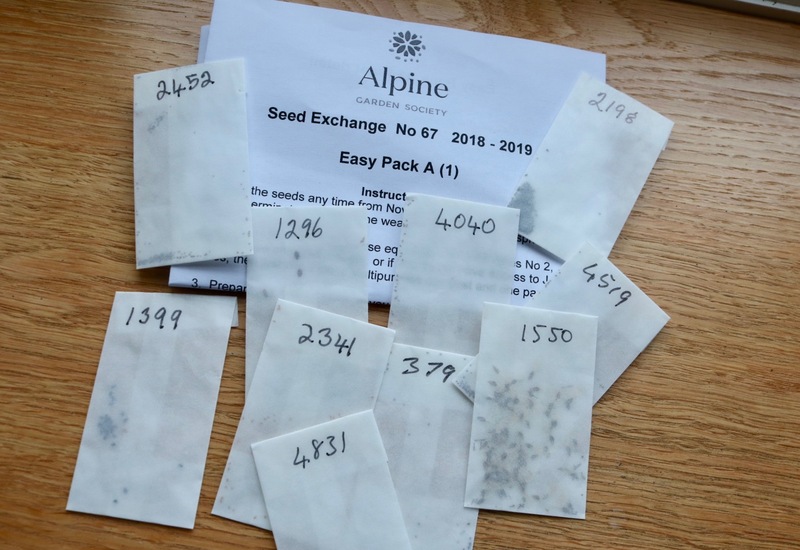 The other advantage is that many of these alpine seeds were teeny tiny – barely visible without my specs on. Watering from above after planting can move these tiny seeds around, although the top dressing of grit reduces this somewhat. I stood my trays for about 20 minutes until I could see that the water had soaked up to the surface, then I took them out ready to sow the seed. The compost soaking time gave me a good chance to get organised with my labels. 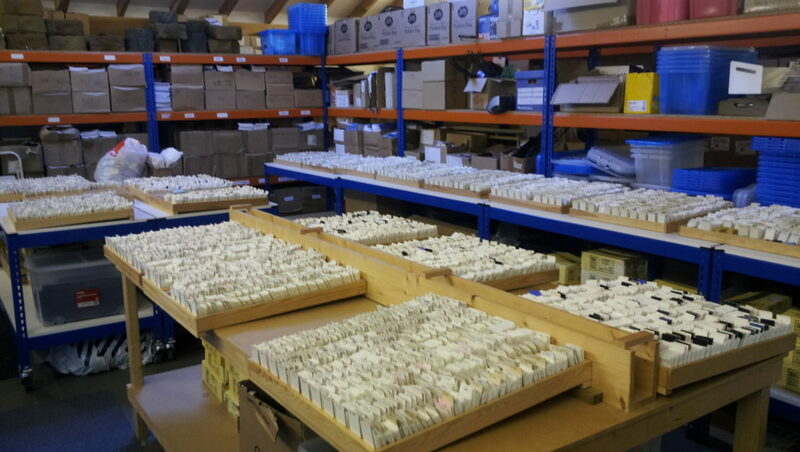 23 seed trays is a lot to keep track of and I knew that labelling would be important. I chose to write both the name of plant and the AGS seed exchange number so that I can refer back to their planting notes. My labels are reused plastic ones and I used a permanent marker (sharpie) as these rarely fade. It was a bit tricky to distribute the seeds well across the seed tray as many were very small. I found the best way was to empty the packets into the palm of my hand and pinch them, then sprinkle. It’s worth tapping the little envelope to make sure you got all the seeds out. Each one is precious. I bought a fairly coarse horticultural grit and it was easy to spread across the top of the pots, with a trowel and my fingers. 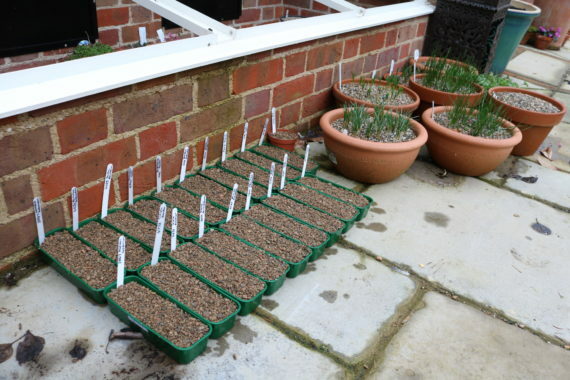 The AGS seed sowing notes say to place the seeds outside so I lined them up against my coldframes. I made sure I placed them directly on the ground as standing them in a plastic tray would risk waterlogging. Meanwhile, we had the second heavy snowfall of this winter and my seeds were covered on their very first night by snow. I’m thinking I should have put them in the open coldframes, where the lids could have sheltered them from the snow but I reasoned that snowfall would be happening to many seeds in the environments in which these flowers occur naturally. This was the hardest part but six weeks after sowing, germination is visible in five of the trays. I’m well on my way up the mountain!